The time for Jocelyn Gourvennec and Bordeaux to part ways has come. There are just two secure things in 2017/18 Ligue 1 season: PSG are set to win the championship and Bordeaux are struggling. Speculation about the end of Jocelyn Gourvennec’s tenure at Matmut-Atlantique have already quickly risen: Bordeaux’s ultras, The Ultramarines, recently released a statement asking for the resignation of the coach, whilst a group of them arrived at the training ground to show their disappointment towards the manager and the players after their cup exit. The field tells otherwise as the Girondins looked vulnerable in defence; lacking in creativity in the midfield; powerless up front despite the €10m they spent to lure Nicolas de Préville away from Lille. Bordeaux also lost to US Granville, a fourth division side, in the last-64 stage of the Coupe de France. Bordeaux looked to have turned a corner after a win against Troyes but after a 2-0 home loss to Caen – that left the Girondins just two points above the relegation zone – following another embarrassing performance, Gourvennec’s fate has been sealed as the manager was sacked. That is a huge blow for a manager who won the Coupe de France with Guingamp back in 2014 and who has been considered as one of the most promising managers in Europe just few seasons ago. Yet, expectations were high at Bordeaux after the 6th place the club obtained last campaign. That finish led club and fans to raise the goal and Bordeaux’s ownership thought the team were good enough to challenge for a European spot. However, the club’s summer transfer politics haven’t been good enough to comply the needed standards to make the Girondins a real contender for an European place. First and foremost, the choice to let go veteran goalkeeper Cedric Carrasso at the end of his contract didn’t pay off. His replacement, former international Benoît Costil, showed to be an able no.1 who posted a remarkable 2.3 saves per game but suffered from playing behind a porous backline that allowed 31 goals (just five teams have done worse). That’s happened despite stats telling us that the Girondins allowed just 10.8 shots per game: the third best defence behind PSG and Montpellier. Costil’s skills on the posts wasn’t enough to save Gourvennec. The 6-2 defeat to Paris Saint-Germain in September was the low point for a backline that has never looked solid. Things didn’t go better on the offensive side of the ball with Brazilian starlet Malcom being the only light up top. Former Lille forward De Préville scored more goals (2) in his 4 games at Pierre Mauroy than during the rest of the current season at Bordeaux (just 1). Sure, he added two assists to his stats and produced more dribbling (2.5 versus 0.3) but he has not been a real scoring threat for the Girondins so far. Gaëtan Laborde too didn’t contribute providing just one goal out from merely 1.6 shots per game. According to understat.com model, Bordeaux’s expected goals rate is 25.16, the sixth best in Ligue 1. This means the Girondins are clearly underperforming up top so the questions is why Bordeaux’s offense struggled so much. 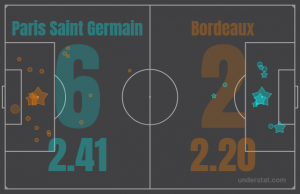 understat.com’s xG from the game against PSG is an example about how the Girondins were able to produce quality shots under Gourvennec. But they often failed to convert them into goals. You can’t blame just the players as Gourvennec’s approach clearly got a part on this. The manager tweaked his tactics during this half-season, but he never has been able to find a road in there as his classic 4-3-3 plodded. Gourvennec’s dismissal also led Jérémy Toulalan to abruptly ask for a termination of his contract with the club as he didn’t want to remain at Bordeaux after Gourvennec was sacked. Bordeaux accepted the 34-year-old midfielder’s request who joined Girondins in the summer of 2016 from Monaco. Toulalan’s role this season also has been disputed as Gourvennec unsuccessfully tried to convert the midfielder into a centre-back. Former Lyon midfielder posted decent stats providing 2 tackles and 1.3 interceptions per game, but he lacked pace to play so deep. Although former Club Brugge coach Michel Preud’homme was supposed to ba named Bordeaux’s next boss, the club substituted Gourvennec by appointing Gus Poyet as new manager, a decision that raised some eyebrows between pundits and fans. In fact, Poyet’s coaching career suffered some up and downs latest seasons as the Uruguayan manager saved Sunderland from relegation just to be sacked the following year after a 12 league winless games run. Subsequently he’s coached six months at AEK Athens before being fired after a clash with the club’s president. Finally, he struggled at Real Betis parting the way with the Spanish club after just four months in charge. His experience with Chinese Super League’s side of Shanghai Shenhua also didn’t work out. So, doubts about Poyet’s chance to save the Girondins look legitimates despite the glimpses of renaissance the team showed under interim coach Éric Bedouet by defeating beating Nantes 1-0 in the first game after Gourvennec-era. With Lille gaining renewed hopes after they appointed Christophe Galtier as their new manager and with St Étienne trying to do the same with Jean-Louis Gasset, the room for errors became thin at the bottom of Ligue 1 this season. Angers and Metz actually occupy the relegation spots but both teams recently showed some signs of life. So, Bordeaux – a club who won the Ligue1 back in 2008/09 – is in peril to be relegated following a troubled season. The Girondins aren’t accustomed to survival battles and this lack of experience could play a pivotal role in the race to avoid relegation.